– Clara Miller, founding member of The Good Fight team, Athens Academy Sophomore, and the LLS Student of the Year. 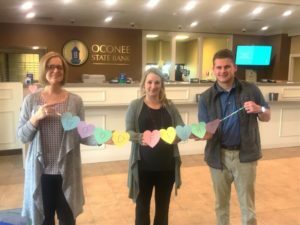 Oconee State Bank vows to be essential in people’s lives, by marking their lives in remarkable ways. For the month of February, we are thrilled to be partnering with The Good Fight, a group of dedicated students raising money for the Leukemia and Lymphoma Society. The mission of The Leukemia & Lymphoma Society (LLS) is: Cure leukemia, lymphoma, Hodgkin’s disease and myeloma, and improve the quality of life of patients and their families. This cause is so very important that we are empowering our customers to participate! Customers who wish to donate money will be able to write their name on a paper heart that will be posted in any one of our Financial Centers. Stop by today or any day this month to help LLS accomplish their powerful mission. To find out more about the team we are working with please check them out on Facebook- The Good Fight Athens.